Janet Mills speaks in the Governor’s cabinet room. On March 28th, Gov. Mills signed her second financial order drawing money from Maine’s Budget Stabilization Fund, often called the Rainy Day Fund, despite Maine having a record budget surplus. 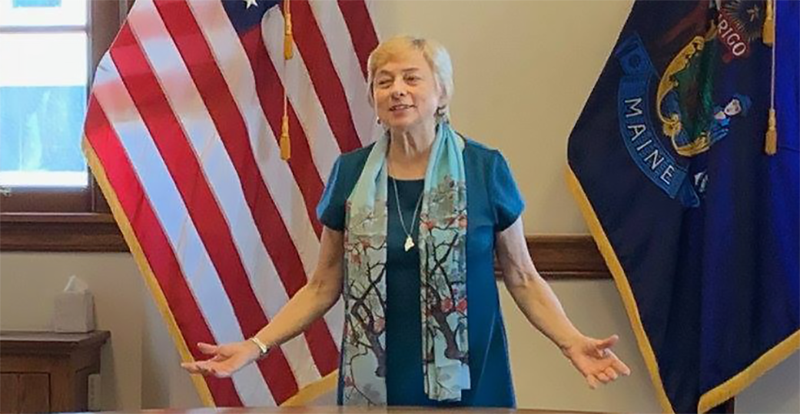 AUGUSTA – A financial order signed on March 28th by Governor Janet Mills drew $3.5 million from Maine’s Budget Stabilization Fund, often called the Rainy Day Fund, for the second time in her first three months as Governor. When presenting her state budget proposal, Mills said she had ‘protected’ the fund and had said she had ‘no interest’ in raiding it, but as of March 28th, less than three months into her first year, she has drawn more than $14 million from the fund. The purpose for the March 28th hit to thes Rainy Day Fund, according to the financial order, is “Negative Grant Awards” from the Centers for Medicaid and Medicare Services. Under the LePage administration, $65 million was set aside to pay for federal penalties that were anticipated as a result of deficiencies at Riverview Psychiatric that were uncovered in 2013. The Rainy Day Fund exists to provide contingency funds in the case or recessions or budget shortfalls, but Maine currently has a record budget surplus. Governor Mills, however, has proposed spending all but a small fraction of that surplus in the two-year budget proposal she sent to the Maine Legislature. On March 15th, 2019 the Maine Legislature’s Office of Fiscal and Program Review told lawmakers that Janet Mills’ budget proposal was actually not balanced, and would run short of funds in the second year.